Somatic Experiencing is a form of therapy aimed at relieving and resolving the affects of traumatic stress injury and other psychological and physical trauma-related health problems. In it, he discusses at length his observations of animals in the wild, and how they deal with and recover from life-threatening situations. He concludes that their behaviour gives us “an insight into the biological healing process” (p. 98), and that “the key to healing traumatic symptoms in humans lies in our being able to mirror the fluid adaption of wild animals” (p. 17-18) as they avoid traumatization in reacting to life-threatening situations. 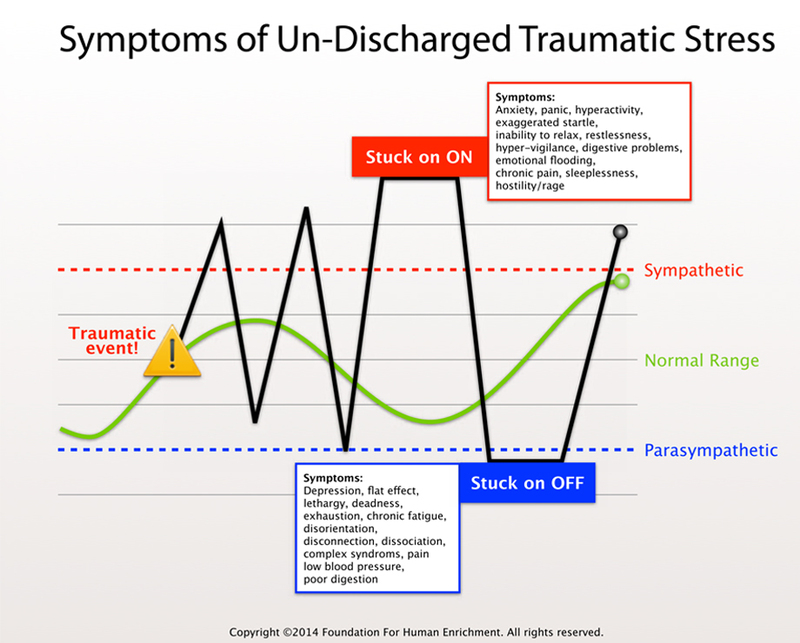 The basis of Somatic Experiencing is that the symptoms of trauma are the effect of a dysregulation of the autonomic nervous system (ANS). SE regards the ANS as having an inherent capacity to self-regulate that is undermined by trauma, and practitioners have found that the inherent capacity to self-regulate can be restored by the procedures of Somatic Experiencing. The procedure, which is normally done in a face-to-face session similar to psychotherapy, involves a client tracking his or her own felt-sense experience . Practitioners of Somatic Experiencing are often also psychotherapists, Rolfers or BodyWorkers. Certified practitioners must complete a training course that spans three years. The procedure is considered by its practitioners to be effective for Shock Trauma in the short term (typically one to six sessions). It is also considered effective for Developmental Trauma as an adjunct to more conventional psychotherapy.